"The Frustrated State is more than an academic exercise. It represents a practical tool to place in the hands of our politicians and policymakers as they struggle with future technology policy issues." In his career as a journalist and policy advisor, Renai LeMay saw Australia's political class up close and personal: Behind the scenes and away from the cameras. What this experience taught him is that our politicians generally try and do the right thing when it comes to technology policy. But that hasn't stopped them from getting technology policy completely wrong. Over and over again. The past decade of technology policy development and implementation by Australia's political sector has been catastrophic for all concerned. 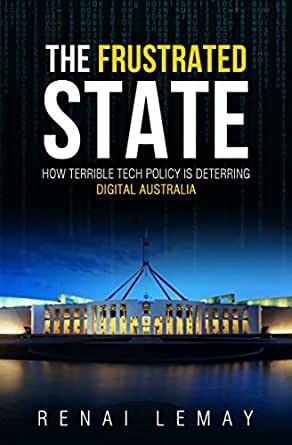 The Frustrated State is the first in-depth examination of how Australia's political sector is systematically mismanaging technological change and crushing hopes that our nation will ever take its rightful place globally as a digital powerhouse and home of innovation. It will also humbly offer a few basic suggestions to resolve the situation. At times during Renai's career he was a thorn in the side of those in power; at times he was seen as a laughing stock even by his most loyal supporters. The most common thing people said about Renai's writing was that they didn’t always agree with it; but that it was worth reading anyway. Expected this to be a touch dull, a litany of bad management and 'told-you-so', but Renai's way with words and insight into the machinations of policy and the wonks who administer made it well worth the read. So good in fact, it's worth reading twice, especially Chapter 4. For anyone who's lived through the evolution of Australia's tech policy this is a must read. Renai has been the number one journalist following all aspects of IT policy for years, so he was on the ground covering much of this stuff as it happened. His research is very in-depth, and paints a sad picture of Australia's policy-making.